On The Energy Collective site (EC) I am noticing more and more contributions from people who know what they are talking about. Like Barry Brook’s BraveNewClimate.com, EC is a place where you can read conversations where at least one side has real-world experience with some aspect of the energy business. Some plants may also use nuclear power to generate electricity, but this method is relatively expensive and may be hazardous to human health and the environment. You don’t see many solar panels exploding or causing dangerous radiation to local residents. Here in Europe, Spanish investors in solar power systems are still reeling from the collapse of the subsidy system in their country as a result of its deep financial crisis. Many have seen family fortunes dissappear as banks seized their solar farms which became unprofitable overnight when ‘guaranteed’ subsidies were eliminated in desperate attempts to prevent sovereign default. While Spain has the best sunshine in Europe, there is virtually no PV being installed there since the crisis. PV is simply too costly and Spain is simply too deep in the hole financially and socially for it to even consider extracting the necessary funding for subsidies from its impoverished tax payers. I agree that we have to find a way to exist for centuries to come. Fortunately we don’t need to look far. Nuclear energy has the proven potential to provide limitless energy cheaper than coal. While the nuclear option has many other unique benefits to humanity, this particular characteristic of being able to compete (without subsidies) with coal means that it is the only credible hope humanity has of stopping antropogenic global warming and ever increasing fossil fuel dependence. “Hot new” energy technologies are exciting and interesting, and I love them, but they are no use. The political will to provide for their permanent (!) heavy subsidy does not exist in developed countries. And in developing countries, the enthousiasm for such permanent subsidies is of course even less. Hence, a thousand coal fired power plants are planned or under construction globally today. Coal is death. Nuclear power is hope. Renewable energy is a distraction, unfortunately. Sarah, it’s true that solar panels don’t explode (most deaths from solar are the result of falls from rooftops during installation). The fact is that while most people harbor an irrational fear of radiation, nuclear is five times safer than solar per unit of energy generated, it occupies a tiny fraction of the land area, and delivers power with six times the capacity factor, day or night, rain or shine. While powering the world on renewables alone is theoretically possible, from a practical standpoint the chances of doing so are zero. It would cost hundreds of $trillions in 2014, and there’s no evidence that the price will drop fast enough or that a buildout could happen fast enough to keep pace with the exploding global demand for energy. The graph below makes that evidently clear – wind’s contribution to world electricity is the skinny purple line, and solar’s contribution is invisible. This is what I mean by reinforcing misperceptions. It’s critical that we examine our energy options on a factual basis, and not one of popular culture myths which persist four decades after The China Syndrome if we’re going to have a chance of getting a handle on climate change. Bob, that graph makes your point perfectly. Besides, the graph also shows the serious consequences of anti-nuclearism. 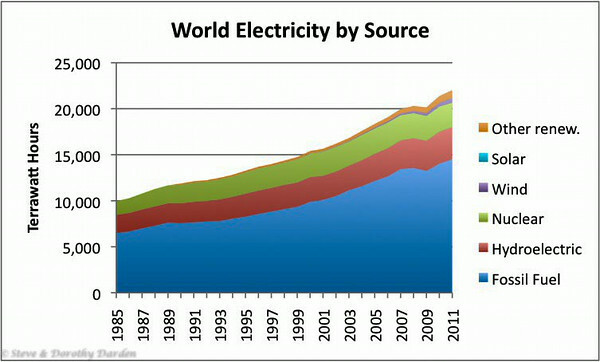 Between 1991 and 2011, twenty years have passed in which nuclear energy grew only very slightly. If the world had adopted the French nuclear energy strategy, then fossil fuels for electricity generation would have been zero today. Nuclear and hydro together would have covered the whole electricity demand. Advocates for renewables against nuclear don’t seem to understand that their ideology is no solution to the problem of exponential fossil fuel consumption. On the contrary, as the graph clearly indicates, *their ideology is itself the cause *of historical exponential fossil fuel consumption for electricity generation. This entry was posted in Energy Policy by Steve Darden. Bookmark the permalink. FYI: It is fascinating to learn that you follow my comments to discover threads/topics on TEC. Well, “time is the most valuable thing we have” so I value your comments when you do have the time. I miss things on TEC by this method, but it’s all about signal-to-noise.